The definition of percent is out of one hundred parts. 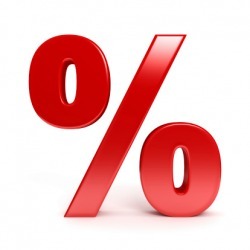 An example of percent is a 2.5 percent interest rate paid in a bank. The definition of a percent is one out of one hundred parts. An example of a percent is one person out of each hundred people being vegetarian. "percent." YourDictionary, n.d. Web. 16 April 2019. <https://www.yourdictionary.com/PERCENT>. Also written per cent or Now Rareper cent. pl. percent, also per cent One part in a hundred: The report states that 42 percent of the alumni contributed to the endowment. Also called per centum . pl. percents A percentage or portion: She has invested a large percent of her salary. percents Chiefly British Public securities yielding interest at a specified percentage. Short for Early Modern English per centum ( formed on the model of Italian per cento for (every) hundred )Latin per through, by ; see per . centum hundred ; see dek&mlowring; in Indo-European roots. Usage Note: Statistically speaking, a quantity can be increased by any percentage but cannot be decreased by more than 100 percent. Once pollution has been reduced by 100 percent, for example, it ceases to exist. In defiance of this logic, however, advertisers sometimes refer to a 150 percent decrease in lost luggage or a new dental rinse that reduces plaque on teeth by over 300 percent. Presumably what is implied by the latter is that the new rinse is three times as effective as some other rinse, but such constructions are still subject to criticism as illogical. •et; Percent can take a singular or plural verb, depending on how the quantity being described is viewed. Very often what determines the form of the verb is the noun nearest to it. Thus one might say Eighty percent of the legislators are going to vote against the bill or Eighty percent of the legislature is set to vote the bill down. In the second sentence the group of legislators is considered as a body, not as individuals. When percent is used without a following prepositional phrase, either a singular or plural verb is acceptable. Expressed in percents; usually together with a number. I got a ten percent raise! The whisky usually contains over fifty percent alcohol by volume in the maturing casks, while the commercial brands are diluted to 40 to 45 percent. Latin per centum (“for every hundred"). "Under ten percent," he replied. I was a hundred percent truthful—same as always, almost. That eighty percent went to ninety nine. He said about 99 percent of the people in the world just go along and let things happen to them. She took about eighty percent of your tips at the call center.